To check our actual offers in Rhodes, please use the white form above. Just enter the desired dates, time and pick-up/return location. The most recent car booking in Rhodes has been made on our website 3637 minutes ago.. In Rhodes, we offer for rental 10+ car categories from 44+ rental suppliers. OrangeSmile provides one of the lowest rental prices on the worldwide market. You can save on your car hire in Rhodes even more: (1) by renting your car purely at an airport with the pick-up/drop-off at daytime; (2) by keeping the pick-up and return at exactly the same rental location in Rhodes; and (3) since rental prices in Greece are computed based on 24-hour interval, try to match this period and return your car just before your last 24-hour period expires. Additional saving can be achieved by making your reservation few months in advance. Rental rates in Rhodes increase as the rental date is approaching. To avoid financial risks in case of an accident or a theft in Greece, we advise to order an insurance package with the full franchise coverage (Zero Excess). You can do it directly at the rental desk in Rhodes, or during your booking time on our website. Before visiting your rental office, prepare all the required papers that are specified in your voucher, plus, a printed map of Rhodes. Pile the documents together to act quickly at the rental desk during pick-up. Do not forget to examine the car conditions prior to leaving the rental parking in Rhodes: wheels, windows and chassis for scratches and other defects. Check against your rental document whether all the defects are already specified. Rental offices in Rhodes are sometimes strict on delays in car return, therefore, always try to bring the car back to the rental office at the specified time. Explore Rhodes and Greece to the maximum, having your rental car as your friend always near! 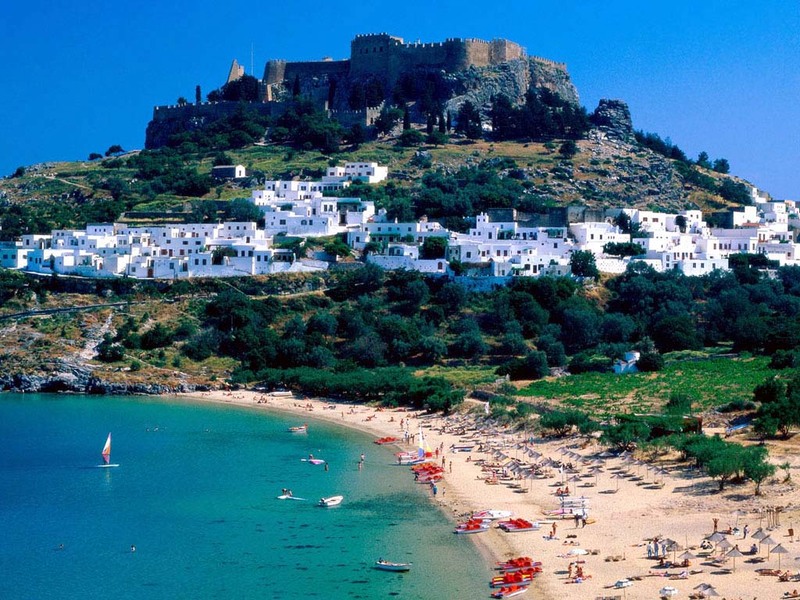 Island of Rodos offers its visitors about 500 accommodation places all with unique features. There's a large number of historical hotels and Camelot hotel located in the capital of the island one of them. It’s situated in the stone medieval building that has survived until today. The house is decorated with lots of original ornaments including crafty mosaics. The cozy inner court is decorated with various sculptures and flowers, while an amazing arched cellar is occupied with a charming restaurant. It’s worth to mention that Camelot hotel is located next to notable historical landmarks. Saint Michel hotel situated near is absolutely unique too. It occupies the completely renovated 13th century building being one the oldest on the island. Masterful stone and wood enrichment, lots of art and national-themed decorations create truly special atmosphere. Rooms are decorated in the romantic style accented with rich textile decorations; some apartments are equipped with amazing tent-beds. Saint Michel is located just a few minutes away from various historical landmarks and cultural centers.